Sometimes things don’t need to be complicated. 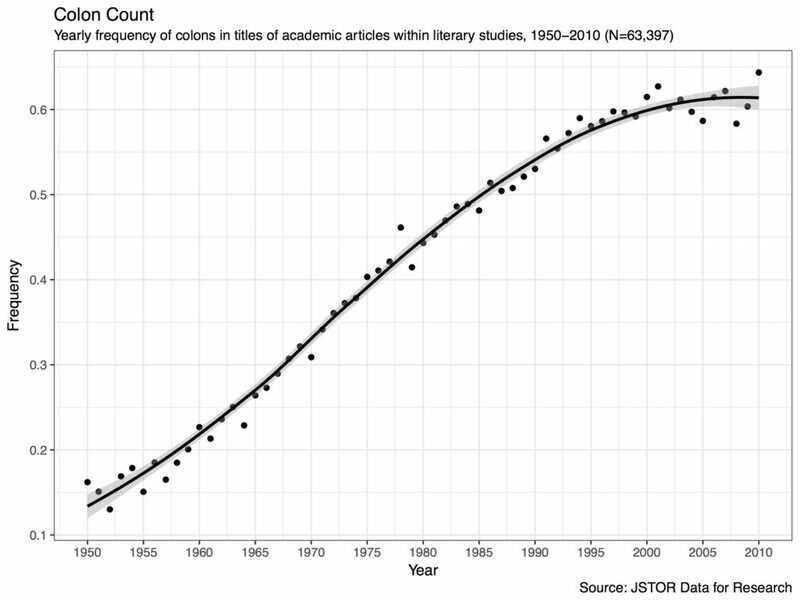 Have you ever wondered about the convention of using colons in titles of academic articles? As in, “Here’s my big idea: now let me narrow it down for you”? Well, I’ve never actually seen something that exhibits this degree of linearity in cultural behaviour (see below). I mean an R-squared of 0.96! It also appears we may have reached maximum colonhood (colonity?). Why do simple things like colons matter? I’ve written about punctuation in my new book, Enumerations (Chap 1), because I think punctuation has *a lot* to tell us about how texts mean. In the book, I zoom in on periods (so many little dots, so strange!). In this case, I’m looking at two dots, stacked on top of each other. I think colons can tell us a lot about things like the standardization of academic discourse, where standardization can be a proxy for what we might also call “scientization.” I’ve been working on a piece on this with my collaborator, Stefania Degaetano-Ortlieb, and we see several linguistic effects that indicate that the field of literary studies has become increasingly standardized and specialized over the years like other sciences, though not as strongly. It suggests that literary studies is this kind of hybrid world, one that mediates between common language and scientific language. Why is this important? I think understanding the large-scale practices of the discipline can help us better position ourselves within the modern academy. Hanging onto ideas of “difference” or uniqueness doesn’t seem like a good fit for the way I’m seeing the data. Mediators or bridgers might be a better model. To better understand this problem of course we need more complex models. But sometimes, simple things can tell you a lot. Did we already know that?